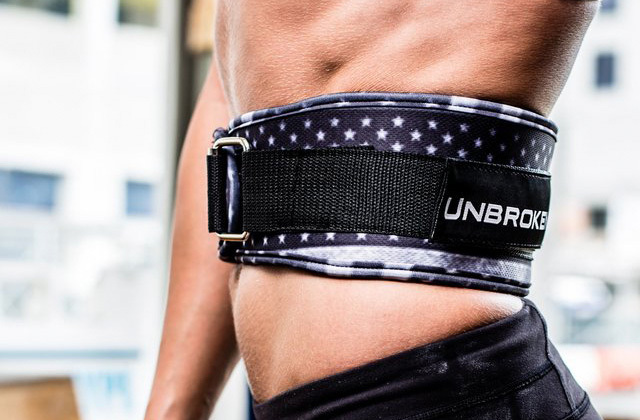 The included accessories will let you do any and all exercises with no limits on your workouts. Shorter people might not feel fully comfortable on the bench. The plethora of accessories and the high quality of the bench itself make this the best weight bench set for those willing to pay more to get top-notch equipment. Its steel frame supports high loads, the exercise variety is almost unlimited, and the design is convenient and reliable. A perfect pick for those ready to spend a bit more than average. 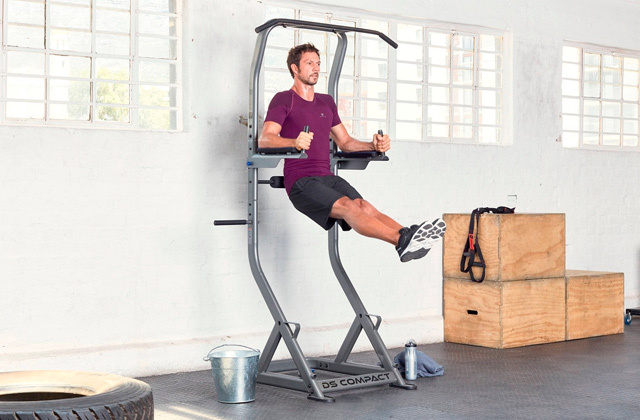 The free-standing tall rack is handy for squats and makes storage easier. A compact alternative to most weight benches that still manages to fit in several accessories for full-body workouts. 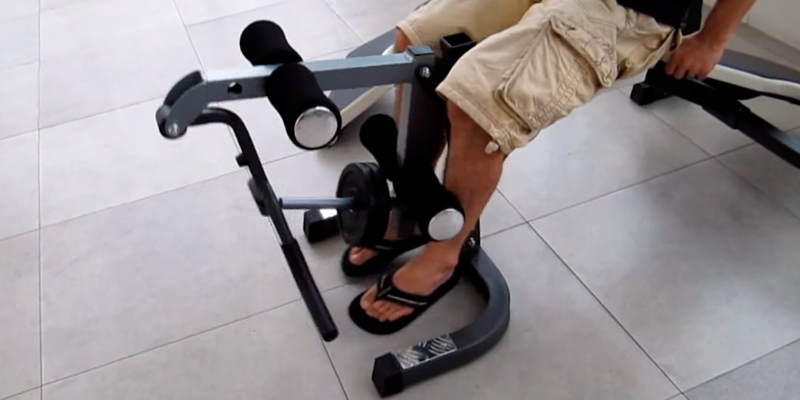 It's an ultra-sturdy and heavy piece of equipment that will let you get some muscle gain on your arms, legs, and chest without leaving your bedroom. 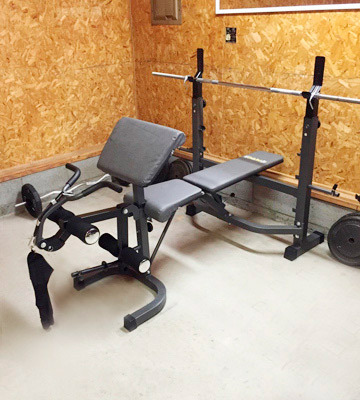 This model is small, easy to assemble, and weighs very little, a good choice for a modest home gym. 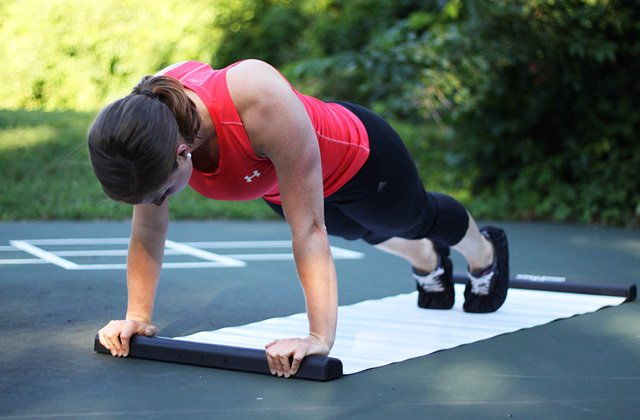 Slides around the floor when working with heavier weights. A very basic model that uses a classic design as a base, adding a few touches of comfort. The bench is padded well, the soft grips are helpful during exercise, and the adjustable height is convenient for doing crunches. If you want to start at the beginning, this is a great take-off point. The lifting lever and 2 built-in wheels make transportation and storage easy. The weights are placed a bit too low on the rack. A classic model that doesn't slide around even if you're heaving 300 lb weights, this is a reliable and relatively compact piece of equipment that's good for basic weightlifting. If the lack of accessories doesn't put you off, this may just be what you need, especially considering the pretty lucrative price. The max load is one of the highest out there, making this model viable for plus-size people. The fixtures for weight mounting are pretty small. Boasting a huge max load, this model is a godsend for plus-size people looking to lose some weight or simply turn it into real muscles. 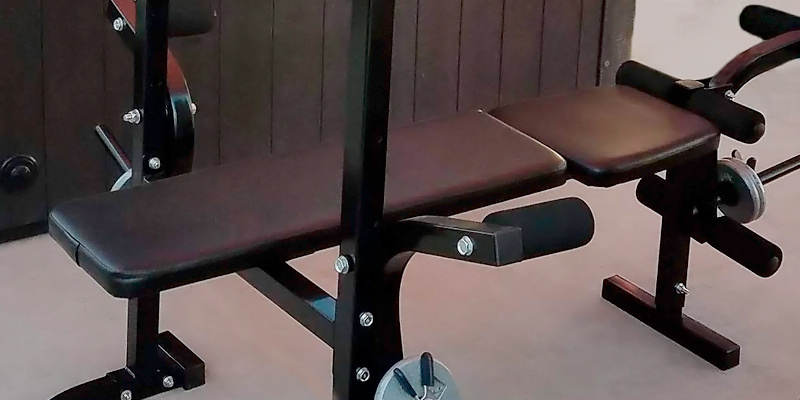 It's a classic weight bench with a few accessories to help you do full-body workouts, though it might not be big enough to hold all of your weights. Still, it's an affordable bench that can actually be used by anybody, not just those already in shape. If you want to do more than just bench press, you’re going to need a kit with many accessories. That’s achievable by either buying a basic one and investing time and money into it or simply getting the Body Champ BCB5860. 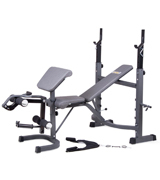 This model comes with plenty of accessories including pads and bars for arm and preacher curls, handles for ab crunches, and more. With this kind of kit, you can try out any type of exercise and really work on all muscles instead of settling for simple bench presses. The only thing this kit doesn’t include is the tools for assembly but you likely already have those. In addition to that, you can position the backrest whichever way you like as there are 7 options to choose from. However, we didn’t manage to find any positions that would be all that comfortable for shorter people. Don’t get us wrong, the Body Champ BCB5860 is pretty good for all but it’s definitely designed for someone tall first and foremost. As for the boring tech specs, well, the max load here is 300 lbs on the bar, pretty good, and 120 lbs on leg curl, surprisingly high. We have to admit that the size is relatively compact for a weight bench so it’ll be easier to find a spot for it in your home. All in all, the Body Champ BCB5860 might offer excellent quality but what it really wins out on is the accessories. 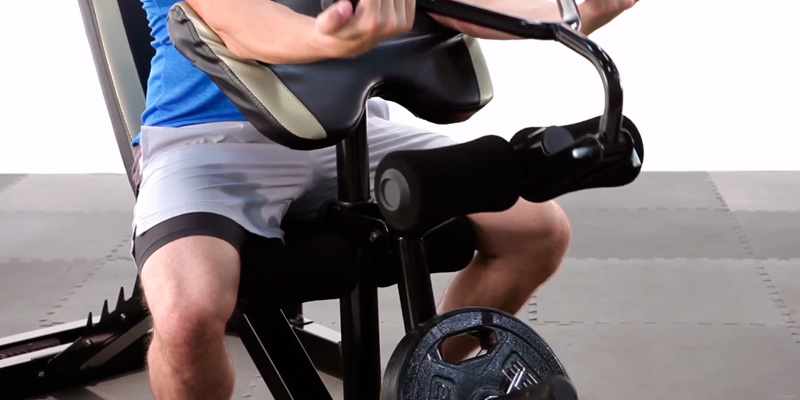 This model is an all-in-one gym and a perfect workout tool. 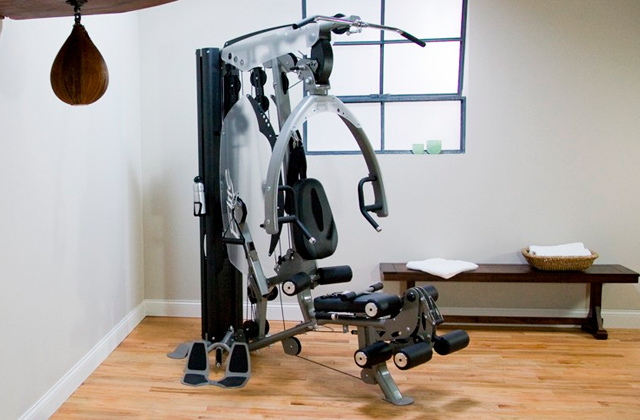 If you don’t have much space in your home but still want a set of equipment that’s as good as you’d get at a professional gym, we recommend the Marcy MD-879. While it might not be a treasure trove of accessories, this modestly-sized kit is enough to do exercises on your upper and lower body. 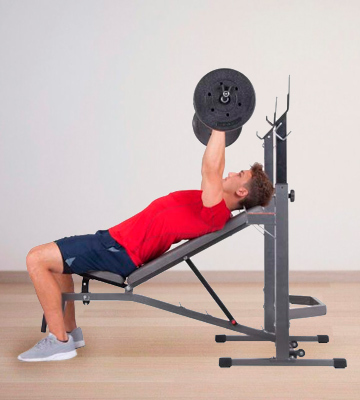 You can move the bench into 5 different positions, depending on the exercises you’re doing. This includes arm curls as the bench has a stand for those. While you don’t get any weights with the purchase, you do also get a squat rack, which is free-standing. 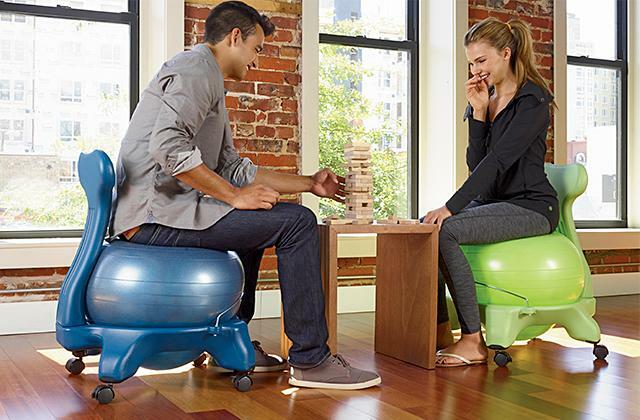 We find it to be a good choice as it both makes storage easier and exercises more convenient. 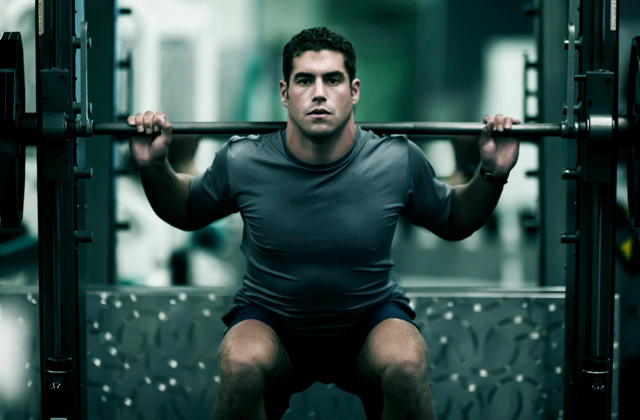 That way you can do bench presses just as comfortably as weight squats. However, before you do any of that, you’ll have to put the Marcy MD-879 together and that’s where the biggest problem lies. All of the equipment is made of steel so you’ll be lugging metal around for hours, trying to assemble it because the instructions are poor and doing everything right on the first attempt isn’t easy. Still, once it’s done, you get a sturdy and reliable piece of equipment. 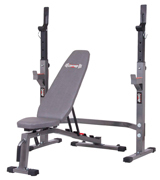 Namely, the Marcy MD-879 supports 300 lbs on crunches and 600 lbs on the bench, more than enough for home workouts. So don’t believe what people say, size does matter, at least in the case of the Marcy MD-879. 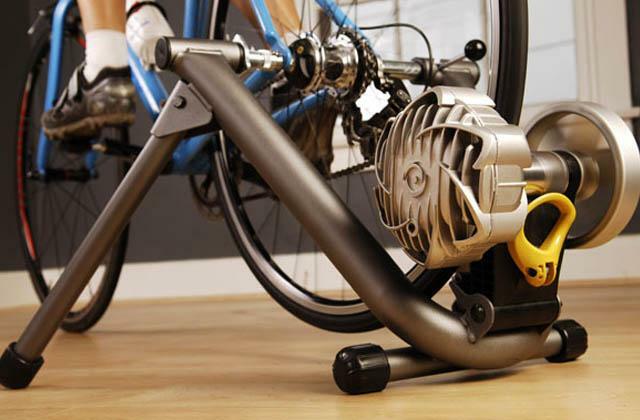 This compact home gym will help you stay in shape without taking up half of your bedroom or compromising on quality. Want to do some basic weightlifting at home and don’t feel like paying extra for unnecessary accessories that you won’t ever use? 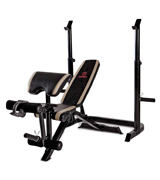 Consider the Goplus Adjustable weight bench set, a basic and reliable piece of gym equipment. It’s true, this model lacks the flair of its competitors as it’s a no-nonsense kit. You get a bench, a weight rack, and an attachment for leg development, that’s it. And, frankly, that’s all you need if you’re trying to beef up and not lose weight. This lack of any extra attachments makes the bench easier to store as it’s smaller than most full-blown kits. However, the Goplus Adjustable is not any less sturdy than its competitors. Made of heavy-duty steel with comfy padding on the bench itself, this model will be convenient to use for hours. And you can stack quite a lot of weight if you wish as the max load is at 440 lbs, enough to really get that workout going. We don’t recommend going for the maximum all the time, though, as the bench might slide around a bit when you do. Last but not least, we have to applaud the assembly process. It’s super easy and takes little time so you don’t have to rack your head trying to put parts together. 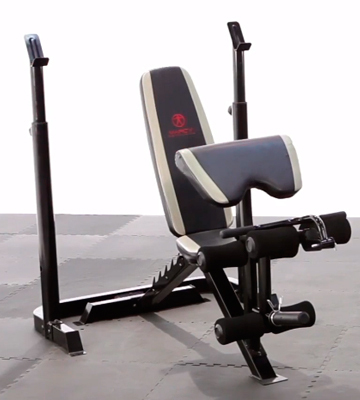 That and the reliability and functionality make the Goplus Adjustable bench a great pick for basic training. If you want to keep your body strong and healthy, this is a great find. Want to practice your bench press at home and do so safely and without paying too much? We’ve got just the right piece of equipment for the task - the Body Champ BCB3835/PRO3900. This bench is a classic model that you can use and then quickly put away as it’s foldable and has built-in caster wheels to move it back to a spot where it won’t get in your way. But storage isn’t what it’s intended for so let’s get down to how you can use the Body Champ BCB3835. The bench height can be adjusted so you lay down comfortably. 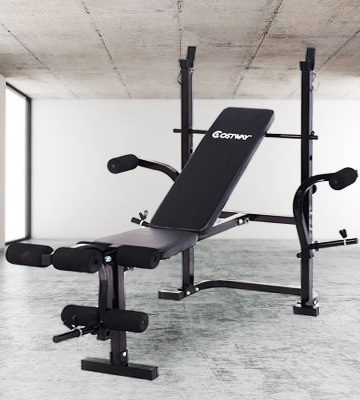 While the max load of 300 lbs isn’t anything special, the bench does have double-deck safety to make sure the weights don’t drop on you, an essential feature that many models seem to omit. Besides, the legs of the bench have anti-skid tips to prevent it from sliding on your floor. We have to admit that the weights are placed a bit too low on the rack so bigger people might find them a bit uncomfortable. In such cases, you can simply use the standalone squat rack instead, a compromise of sorts. 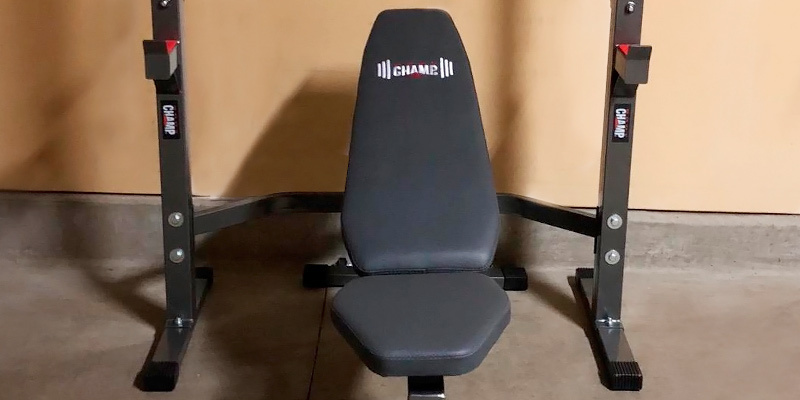 All things considered, as far as basic weight benches go, the Body Champ BCB3835 is one of the most reliable models thanks to its several safety features. We do wish the design was a bit more refined but it’s an affordable and convenient choice for home use. Are you a bigger person looking to get in shape and build some muscle? Sadly, most weight benches don’t seem to be designed for anybody who isn’t already fit, which kind of defeats the purpose. Thankfully, the XMark Fitness XM-4424.1 is a viable and affordable solution. This model has a max load of 700 lbs, enough to support both substantial weights and a plus-size person. With this kind of capacity, you can always be sure that the bench won’t give out just because you decide to lift a bit more. Plus, it also has a section for the safety spotter to stand and that supports up to 300 lbs as well, not too shabby at all. 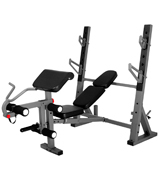 Besides that, the XMark Fitness XM-4424.1 can also boast a handy leg extension and a bar for preacher and arm curls. These accessories are a must if you want to really work on all muscles in your body and get it into shape. And, of course, the bench can be lifted or lowered depending on the exercise you’re doing so you’re always sitting or lying comfortably. Our only gripe with the design is the relatively small weights rack, which limits the number of weights you can store on the equipment for easier access. Still, that’s not that important in the grand scheme of things. As you can see, there’s a lot to like about the XMark Fitness XM-4424.1 whether you’re a bigger person or not. This model offers functionality, high max load, and all accessories necessary for a full-body workout. 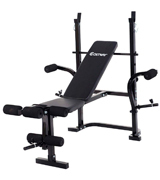 While it does have a few shortcomings, they’re minor compared to the outstanding quality of this weight bench set. What Is a Weight Bench Set? 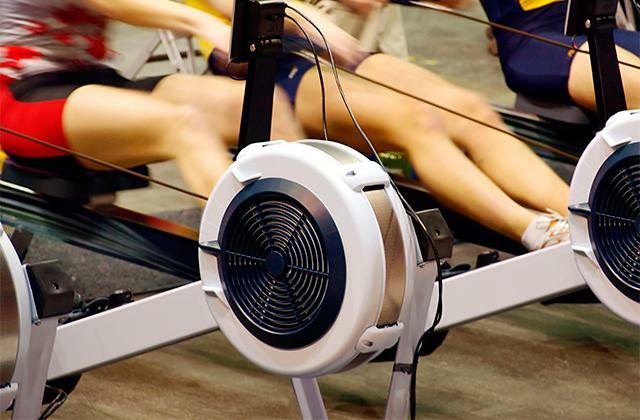 Although most people associate the word “exercise” with either jogging or a huge gym with tens of machines available for weight lifting and curls, it doesn’t always have to look that way. Even a simple weight bench set standing in your bedroom is enough to work out regularly and build some muscle. With most kits you see on the market, the bench itself is merely the foundation from which you can choose any variety of exercises, including lifting weights, doing bench presses, curls, and crunches. All of these are essential if you want to develop different muscle groups and, usually, you’d have to get several gym machines to do all of these. But a weight bench combines everything into one and, though they’re not particularly small, makes it easier to have a home gym. 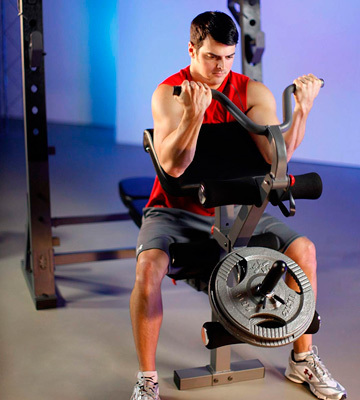 You usually get some accessories with the bench, including weights, pads for curls and crunches, bars, and handles. All of these are useful but might not be essential, depending on what type of exercises you plan on doing. We’d advise getting a weight bench that’s sturdy and reliable as the accessories can be purchased later, once you decide you need them. Still, the choice is yours and we’re only here to help. If you plan on doing some training, we recommend getting either pre-workout or post-workout supplements as they can help you lose weight or build muscle faster. You could even do both but that’s a trickier choice for beginners and we’d advise keeping things slow for your first few months.